Have you ever made a Fairy Garden? I have been pinning photos of fairy gardens for the past few weeks on our Garden Play and Learning Activities Pinterest board. Last week we FINALLY made our own fairy gardens and I'm excited to share them with you! We decided to grab some of our favorite LEGO friends since it is LEGO Week and have them join us for our fairy garden play! 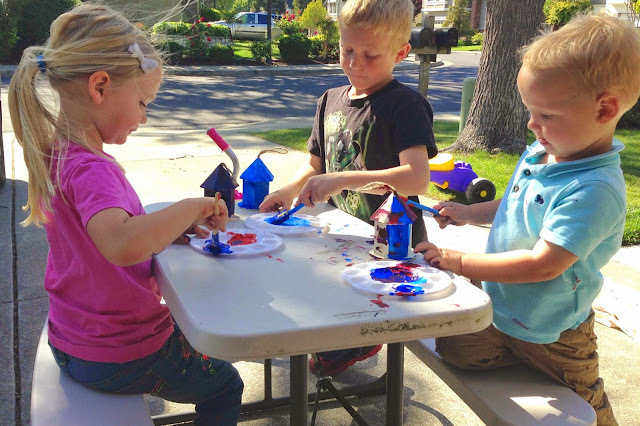 Fairy gardens can be made with a variety of ages of kids and you can just modify the materials depending on the age and skills of your child. I made fairy gardens with all three of my kids (ages 7, 4, and 2) at the same time. It was utter craziness when we did painting, but it was really fun too! As part of LEGO Week we are finding all sorts of fun ways to embed playing with LEGO into our day! This activity might be my favorite post all week! I purchased enough materials to make 6 fairy gardens and ended up spending about $10 per fairy garden. I already had paint, soil, LEGO minifigures, paint tarps, LEGO bricks, and paint brushes at home. We started off by painting out little wooden houses. My kids use a variety of colors on their houses and made a HUGE mess... especially my toddler. We painted outside on our driveway on a little table. When I say huge mess... picture my toddler painting his entire shirt and arms... and then also throwing his paint and paint brush. Don't let this photo fool you. It was the calm before the storm and the reason that this activity isn't more fully documented. One of the most important items we keep close by while we are painting is a big thing of baby wipes. While the houses were drying we got started working on our gardens. We started by scooping about 3 cups of soil into each plastic saucer. We scooped until the soil covered the surface of the saucer and was about 2 inches deep. Next we added some moss (we used fake moss), colored pebbles, river rocks, stumps, and pieces of fence to section off the areas. We also planted some flowers in the soil. In order to do that we needed to make some hills in the gardens so that the flowers lived on the hill and had deep enough soil for their roots. The kids loved watering the flowers in their fairy gardens. We also added the dried birdhouses into the fairy gardens to be houses for the "fairies" or other people living in the gardens. The kids also added some wood stumps for the minifigures to walk on. Once everything was put inside the fairy gardens then the kids brought out all of their LEGO minifigures for some pretend play time! 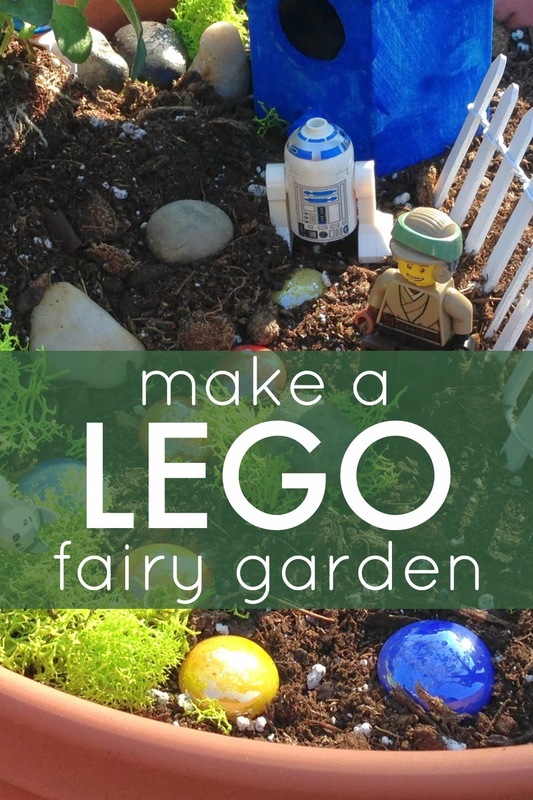 If you want to make your fairy gardens even more LEGO themed you could easily design your own fairy house or other buildings using LEGO bricks and then find it a spot in your soil. The LEGO minifigures are the perfect size for some small world play in our fairy garden! They could fit in the birdhouse holes, relax on the moss, and step on the logs. By now you've probably noticed that there aren't any fairies in our fairy garden... but we're still calling it that. My daughter did bring out some of her favorite Tinkerbell fairies along with Elsa and Anna to play along too. Sometimes small world play isn't intuitive. Just like when you are playing dollhouse with kids or pretend restaurant, you often have to pretend to be a different person. I love watching at my older kids get involved with pretend play and make their characters come alive. Often they learn by watching me. Fairy gardens are full of pieces that are easily moveable so part of the fun is "redecorating" the fairy garden quite often and moving the pebbles, dirt, and wood around to change the environment. 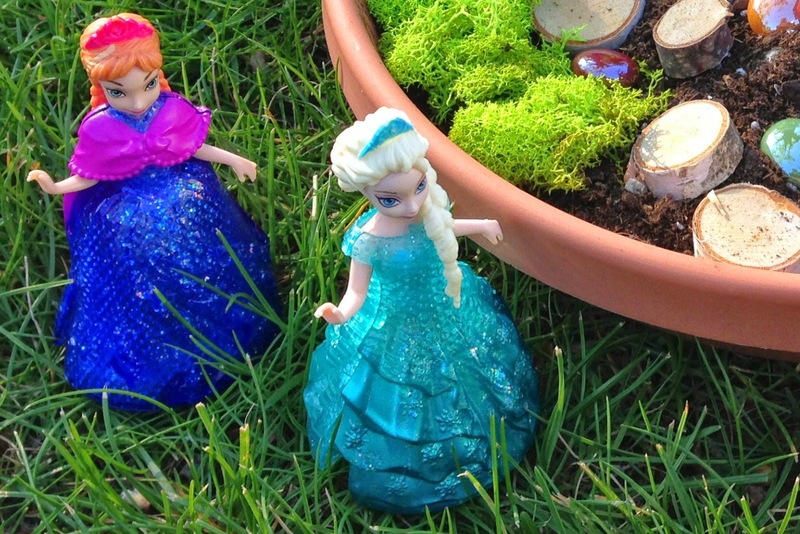 Have you made a fairy garden before? Share a photo or tell me about it! 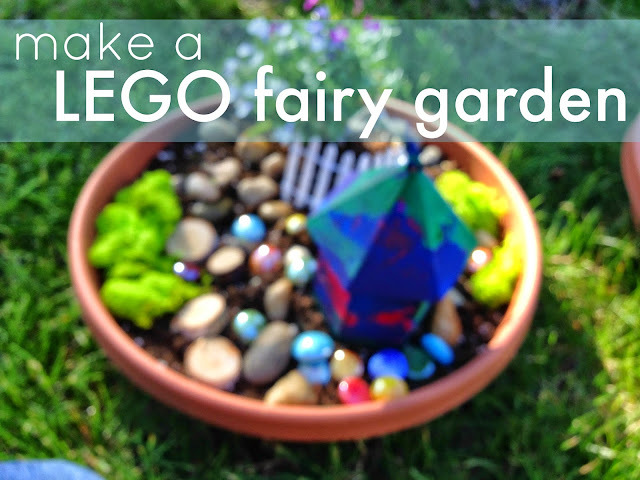 Have you ever included LEGO in your fairy garden play? If you've missed any of the posts so far make sure to head over to our 2nd annual LEGO Week landing page to see all of the ideas shared so far!